Sidermarine produces mooring springs and boat accessories. The new and innovative series of products for the marine industry is characterized by a unique quality of materials, such as those used for the patented new technical mooring spring MPP. It’s important to use the mooring springs to ensure the stability and safety of your boat, in every situation. 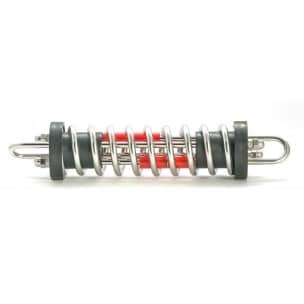 The mooring springs (nautical shock absorber) produced by the SIDERMARINE are made of a special alloy steel with high performance makes them highly resistant to corrosion from seawater and perfectly adaptable to different loads of stress. The mooring springs MPP, thanks to the materials used and the technical solutions adopted in the design phase and production, appears to be very efficient and quiet. Patented stainless steel mooring spring , high performance, low noise inserts, replaceable friction. The materials used and the technical solutions adopted in the design phase and production, appears to be very efficient. The MOLLAFLEX inserts increased the load cushioning. Patented stainless steel spring Mooring specific high-performance, silenced inserts replaceable anti-friction, highly resistant to marine corrosion and perfectly adaptable to different loads of stress, thanks to the wide range of sizes. TOP STANDARD VERSION with 4 insert Mollaflex-Elastomer -increased damping load. The overall cushioning, to 60-70 %, is gien by the compression of the spring, made in a special alloy of stainless steel, high elasticity, and in conditions of greater stress intervenes Mollaflex-Elastomer component. Patented stainless steel Mooring Spring, specific high-performance, silenced inserts replaceable anti-friction, highly resistant to marine corrosion and perfectly adaptable to different loads of stress, thanks to the wide range of size. 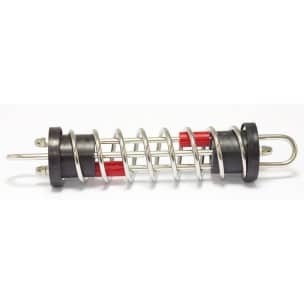 The overall cushioning, to 60-70%,is given by the compression of the spring, made in a special alloy of stainless steel, high elasticity and in conditions of greater stress intervenes Mollaflex-Elastomer component. Patented stainless steel Mooring Spring ,specific high-performance, silenced inserts replaceable friction, highly resistant to marine corrosion and perfectly adaptable to different loads of stress, thanks to the wide range of sizes. 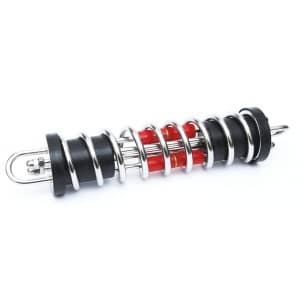 The overall cushioning, to 60-70%, is given by the compression of the spring, made in a special alloy of stainless steel, high elasticity and in conditions of greater stress intevenes Mollaflex-Elastomer component.